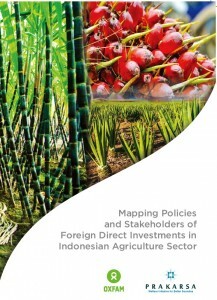 This research takes stock of and maps the Foreign Direct Investment (FDI) in Indonesia’s agricultural sector. The research methodology is qualitative in nature, using case studies in 3 regions of Indonesia to illustrate FDI practices. The work also includes an analysis of secondary quantitative data, for instance on agricultural production trends and investments, and on FDI trends in general. Primary data was obtained using qualitative techniques such as field observations and interviews in Jakarta and in the case study areas to record the opinions of stakeholders (governments, foreign business representatives) and people living or working near the plantations regarding foreign investments practices. The findings suggest that most FDI in the agricultural sector is attracted to the large scale plantation sub-sector, high value and export oriented crops, due to the high profits they incur. The palm oil sector alone contributes more than 85% of the FDI in agriculture since 2008. This was driven by an increased global demand, which has nearly doubled in the last two decades, soil and climate suitability, and fiscal incentives such as tax relief. Law No.25/2007 on Foreign Investment is the key policy that encourages and incentivizes FDI in the agricultural sector. In contrast, the Negative Investment List (DNI), which is periodically reviewed through Presidential Regulations, functions as a disincentive for foreign investment. The Ministry of Agriculture is a central actor in attracting FDI since it sets the sector’s policy. The other core institutions are; Investment Coordinating Board (BKPM), Ministry of Agrarian and Spatial Planning/National Land Agency (BPN), and local governments, including all local government institutions at both provincial and district levels. Under Indonesia’s decentralized system of government, district governments play an important role when it comes to issuing permits and other licenses to support FDI initiatives. For example, HGU (right to use), building permits (HGB) are just two of the many permits that are issued by district governments. Only the principal investment license and the deed of company are issued by the central government. The plasma-nucleus business model must be implemented by foreign companies planning to invest in the agricultural sector based on DNI and Agriculture Minister Regulation No.98/2013. But the study’s results found that it is poorly implemented, if at all, and is the source of conflicts between the companies and communities. Among other recommendations, the government needs to accelerate and clarify the ‘one map policy’ and periodically update the land database to provide transparent information about land for investors and community members alike. It is also recommended that a tripartite or multi-stakeholder body at the local level be established that consists of government, corporate and citizens’ representatives and/or farmers. Finally, the role of BKPM needs to be expanded not only just to issue principal licenses and facilitate investment but also to oversee and advise on legal measures or even law enforcement in cases where investors are breaking the law.